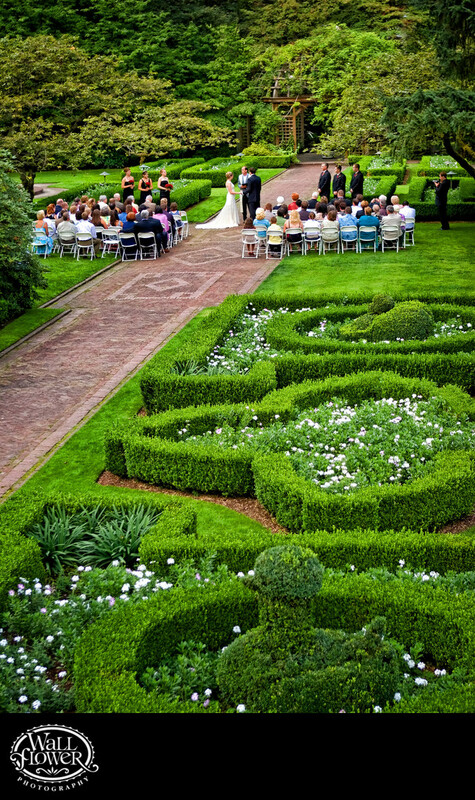 During Lakewold Gardens wedding ceremonies, when opportunity allows, I love to run into the Wagner House and up the stairs to capture this overhead view of the ceremony on the wide middle section of the venue's signature brick walk. The topiary along the right side of the path photographs beautifully at this angle, and you can just make out the teahouse peeking through the dense greenery at the end of the path. To see lots of photos of weddings photographed by Wallflower Photography at this venue, visit our Lakewold Gardens wedding portfolio website at www.lakewoldgardenswedding.com.